During the 2009/2010 skiing season, the Kanin ski slopes were combined with the Italian Sella Nevea ski resort which meant that ski enthusiasts could enjoy high alpine skiing on a twice as large surface as before. 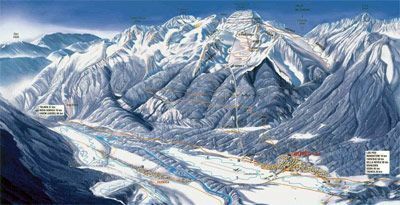 A single ski pass is valid for the combined ski slopes, allowing access to the ski slopes in Bovec and Sella Nevea. The combined ski resort is one of the largest skiing centres in Slovenia. You may ski at an altitude of 2300 metres above sea level on the Slovene side and at a height of 1100 m on the Italian side. The ski resort consists of 30 km (approx. 19 miles) of slopes on a surface of 70 hectares (approx. 0.7 km2). Due to the sunny position of the Slovene side and the northern, shady position of the Italian side, as well as the altitude, skiing is possible from December until late spring. It is a unique experience of high mountains, skiing on natural snow, and magnificent views of the Julian Alps all the way to the Adriatic sea. During the summer, Kanin serves as an ideal starting-point for alpine and hiking tours. It is ideal and accessible for everybody since a cable car takes you right up to the high mountains at an altitude of 2202 m. The last stop of the cable car, the Prestreljenik snack bar, serves as the starting-point for serious mountaineering to conquer the 2000 m high mountains, as well as a starting-point for easier tourist walks and enjoyment. Dom Petra Skalarja lodge 2260 metres above sea level, 45 minutes (open during the summer while the cable car is operational).